Andrew Ganz December 11, 2017 Comment Now! Matthias Erb, the engineer tasked with turning VW’s North American operations from car importer to full-on development office, isn't able to relax for long. Last year, VW finally got competitive in the American crossover market with its redesigned Tiguan and new Atlas. This year, it’s a bigger challenge: reinvigorating a dated compact four-door in a stale segment. 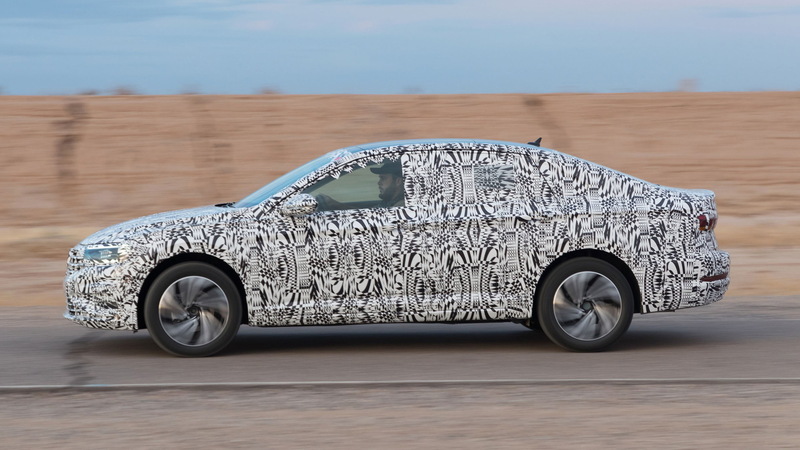 Next month at the 2018 North American International Auto Show in Detroit, Erb will take the wraps off of a long-overdue replacement: the 2019 VW Jetta. Its nameplate dates back to 1980, when VW realized that American buyers weren’t as smitten with hatchbacks as Europeans. Then, they lopped off the Golf’s rear gate, welded on a trunk, and called it a Jetta. It worked then, and Erb is confident that the recipe is just as relevant today. 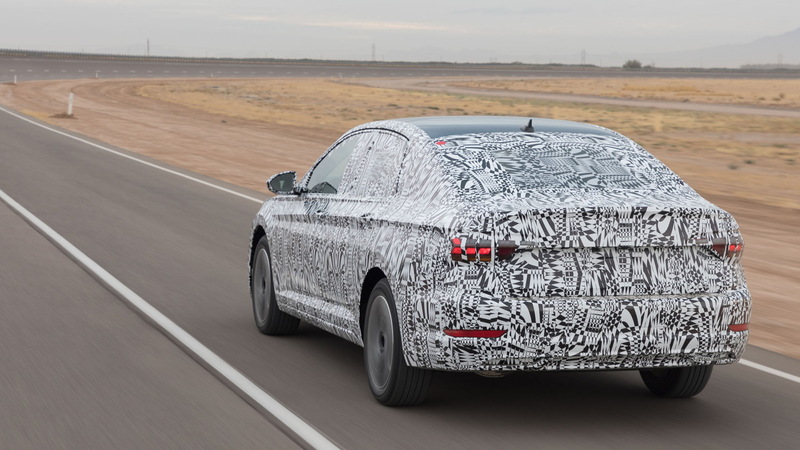 The 2019 Jetta finally migrates to a version of the automaker’s MQB architecture that now underpins the bulk of VW's American-market lineup, as well as some of Audi's. It’s everything you’d expect from VW—a stretched Golf with a trunk instead of a cargo hold. Sure, VW could have tried to spice up the Jetta with a fastback design like the Honda Civic or a curvy body like the Mazda 3. But VW always takes a subtle approach. 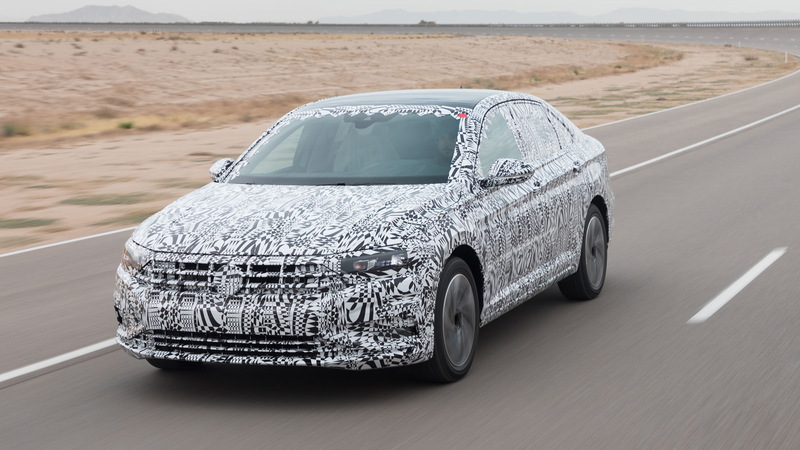 The Jetta’s styling, although obscured by black and white camouflage on the prototypes we saw, is not what will draw customers to showrooms. Instead, it relies on a 3-box look with clean, sharp, conservative lines. LED headlights and taillights are part of the package, presumably to appease the IIHS’s latest Top Safety Pick+ award. VW covered up the interiors on the two prototypes we drove, but what little we could see appears to stick to the brand’s linear convention. Soft-touch trim covers the door uppers for the front seat, but not for the rear, and we saw not a single stitched surface. VW’s highly scalable MQB platform can be stretched in every direction, except for the distance between the front axle and the pedals. Erb calls the MQB VW’s “toolkit” that can be topped with whatever body fits each region. Here in the U.S., you’ll find it under the mid-size Atlas three-row crossover, but it’s also the basis of the brand’s Polo subcompact sold abroad. The new Jetta grows about two inches overall compared to the outgoing model, and its wheelbase is 1.3-inches longer. It’s less than an inch wider, but a lower dashboard and reshaped seats make it feel wider. The rear seat remains spacious, with enough room for a pair of 6-footers to sit one in front of the other, even with a moonroof. Oddly, the Jetta lacks rear-seat climate control vents. Like its MQB siblings, the Jettas we drove at the automaker’s hot weather proving grounds near Phoenix were unflustered at high speeds and able to scoot through corners with a sense of stoicism. A 1.4-liter turbocharged inline-4 will sit under the hood, mated to either an 8-speed automatic or a 6-speed manual. We drove only the automatic, and so will most consumers when the 2019 Jetta goes on sale early next year. Don’t expect the manual to turn the Jetta into a sport sedan, at least in standard guise. The Jetta prototypes—one a relatively low-spec model and another a loaded one with a quartet of selectable drive modes that adjust throttle response, shift points, and steering heft—were composed even when pushed hard on their modest 17-inch Bridgestone Ecopia tires. A brisk desert wind only made its presence notable around the prototype’s mirrors, even at the Jetta’s 125 mph terminal velocity. Straight-line stability was excellent and the three-spoke steering wheel responded smoothly to the driver’s gentle inputs. The upmarket version—which will probably be badged a Jetta SEL—was hardly transformed when put into Sport mode. The steering required a hint more effort and the gas pedal more eagerly sent right foot inputs to the powertrain. Though VW isn’t ready to discuss specific power output for the 1.4-liter, the current Jetta’s 150 horsepower provides a fair estimate. Erb says that the new model’s weight won’t deviate much from the outgoing car’s sub-3,000 pound curb weight. The 1.4-liter was as refined in the Jetta prototypes as it is in the automaker’s Golf lineup. There’s no excess of power, but the turbo spooled up quickly with only a distant whistle. In short, the Jetta is a German sedan, albeit one scaled down to a compact car price point. 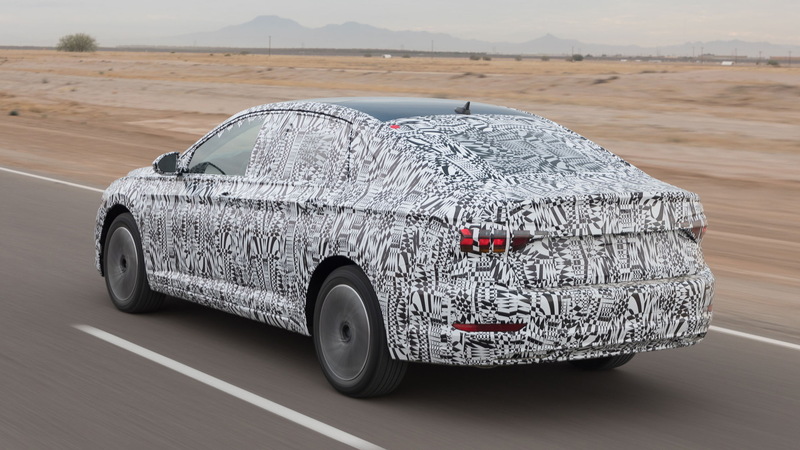 VW shows more confidence in its upcoming Jetta than in the outgoing model, at least as far as aspirational equipment is concerned. Although we weren’t privy to exact specifications, we sat on real leather seats that were both heated and ventilated, and we noticed a memory function for the driver’s power-adjustable throne. Even the spendiest 2018 Jetta features synthetic leather upholstery with limited power adjustment. Beats-branded audio supplants the current Jetta’s Fender unit and, like its siblings, top-spec variants will feature a digital cockpit that replaces an analog gauge cluster with a configurable LCD display. Some of these features require the MQB architecture’s wiring harnesses. A more advanced automatic emergency braking system, active lane control, automatic post-collision braking, and adaptive cruise control that can both bring the car to a halt and start it up again in traffic without driver input will make their way to the Jetta. One feature that MQB isn’t designed for is a large, high-capacity battery. That’s the domain of the automaker’s MEB architecture, which will underpin an entire lineup of electric cars due in 2020. 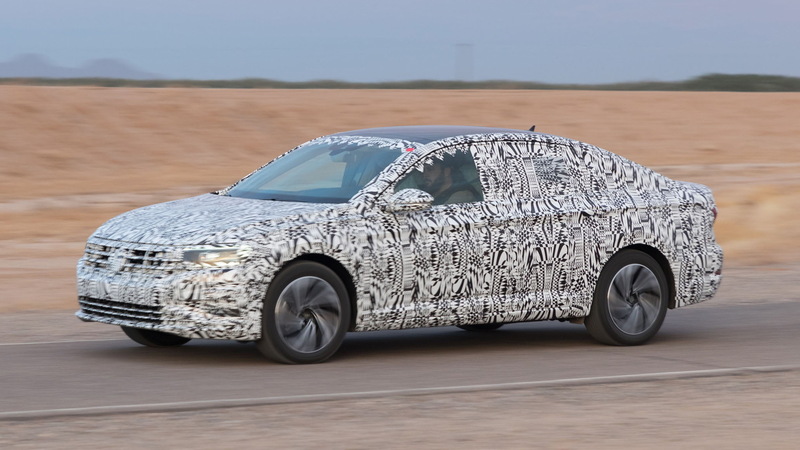 MQB is designed to accommodate hybrid and plug-in electric car powertrains, though, so it’s safe to assume that VW will try another Jetta Hybrid. Despite promising first impressions, the Jetta must clear a big hurdle. Just about any crossover will find buyers, making the Tiguan and Atlas launches feel like a walk in the park. A sedan, on the other hand, Erb has real reason to furrow his brow this time. VW provided travel and lodging to Internet Brands Automotive to bring you this firsthand report.